We will start with the HTML. For this component we need just a container and the buttons. As I just mentioned above, we will use the FontAwesome icons for the buttons, they’re not exactly the same as in the original submission but they’re good enough. Right now we should have the four icons, it’s time to make it look more like the final product. In the container we need a background color, I’ll use black for now but later we will change that programatically. Also I’ll use `flex` and `justify-content` to center the elements horizontally, then just some padding to vertically align them. For the buttons there’s a bit of more work needed, we’ll use `inline-block` so that they render beside each other. After this the selectedId will change on every click to values between 0-3, but that doesn’t seem to do anything to our component. We need to start animating things! Let’s begin animating the simplest part, the background color. For that we need to make a computed property that will get the selected button data which will help us to get the corresponding background color. The colors transition looks really straightforward, the button’s background changes to white when inactive, and to the color property when active. 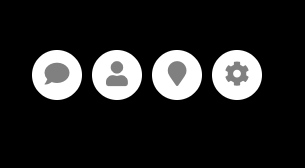 For the icon, it just changes between gray and white. The interesting thing is with the button width animation, it looks kinda “elastic” because it goes a bit back and forth at the end.